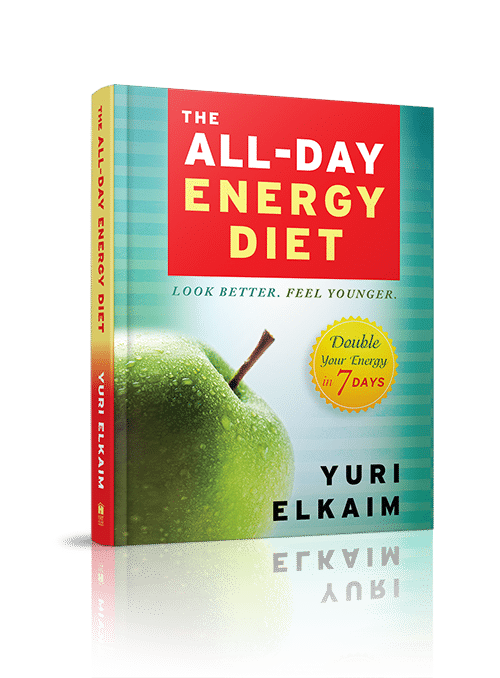 It’s been more than a year in the making and now we’re just one week away from the official release of my new book – The All-Day Energy Diet. It hits store on September 23, 2014. And I’ll be giving you tons of amazing surprise bonuses when you grab your copy during that week (see banner above).It’s easily the BEST work I’ve done (in book form). And I know it will make a big difference in your life. I’m tired of seeing fatigue and lethargy consume millions of people and I don’t want that kind of life for you either. Feeling groggy in the morning…not sleeping well…falling asleep mid-afternoon…having nothing left in the tank at the end each day is no way to live. That’s one of the reasons that I wrote this book. The other (and more selfish) reason I wrote this book was for myself. For nearly 20 years of my life, I had less energy than a solar panel on a cloudy day. I needed to sleep 10-12 hours just to get by and I didn’t realize this at the time but my exhaustion was a WARNING SIGN from my body that something far worse was brewing inside. I’ll share exactly what happened inside the book. For now, I want you to realize that low energy is a serious thing. It’s not something you should be ok with, nor accept as the norm. It’s not normal to feel tired all the time. Thankfully, you won’t have to for much longer. In this post, I want to give you “sneak peak” inside The All-Day Energy Diet by showing the full table of content and giving you a sample chapter from the book. At the bottom of this post, I’ve also included video reviews from 3 of our early readers. I know you’ll find their transformation remarkable and completely duplicatable for you as well. As my book promises, you CAN double your energy in 7 days or less! Without electricity, you can’t turn on the lights in your home. Similarly, without gasoline, your car won’t start or go anywhere. So what is it that allows your body to perform basic functions such as lifting this book (or your e-reader) and reading this sentence? It’s a pity that we don’t gain a better understanding of how our bodies work when we’re growing up. DVD players and wash- ing machines come with instruction manuals, so why don’t our bodies? I mean, we are taught a few things as teenagers, but how much of it do you actually remember? Can you recall anything about the Krebs cycle? Does the term glycolysis ring a bell? Probably not, but that’s okay. I’m not going to berate you for failing to remember all the details of biology class, but I do think it’s important for you to understand your most basic and fundamental inner workings. You’re on a quest to become the fully energized being you were born to be, and part of that mission involves knowing what pow- ers your ability to speak, walk, and even think. Simply put, you need to know where your energy comes from. Don’t worry—I’m not dragging you back into the high school science class you should have taken, or even the one you took and simply didn’t pay attention to. In fact, we’re going to skip the bor- ing stuff and get right to what you need to know, the information that will make a lightbulb pop up over your head. I firmly believe that understanding where your energy comes from will make it easier for you to overcome the sloth-like days you’ve been facing. For so long, you’ve been juiced up on stress and caffeine, thinking that sheer determination will help you through your day, but it’s clearly not enough. You wouldn’t be reading this book if it was. Once you know what generates energy in your body, it will be that much easier to kick the bad habits that get in the way of this process. Better yet, you’ll be able to stoke your internal fire even more and really get your engine going. Actually, you might want to consider this the instruction manual to your body that you never received. The first thing you need to understand is that you’re nothing more than a bunch of cells. I hope that doesn’t sound like an insult, but it’s the absolute truth. You are a you-shaped collection of cells—trillions of them, in fact. Everything inside and outside of you is made up of these tiny, microscopic things, from each millimeter of your toenails on up to that big, marvelous heart of yours. Now you’ve probably heard the term cell used in conjunction with something else before: batteries. That’s because the cell of a battery is essentially its heart, the very source of the energy it needs to operate and power whatever you put it into. Your cells serve the same function inside of you. They power you up. As complex as that sounds, your cells only need two things to create it: glucose from the food you eat and oxygen from the air you breathe. That’s right: all of your energy comes from eating and breathing. Now that sounds very simple, and it really should be, but the way we live these days complicates matters. As we’ve discussed, most of us eat far more than we need to, which means our cells are getting more than enough glucose to create the ATP they need. For those of us struggling to get by with low energy, what our trillions of little cells are so sorely in need of is more oxygen. That might sound a bit odd given the fact that you’re breathing right now. If you weren’t, you wouldn’t be alive. Therefore, there’s a simple question that needs to be answered: if you’re breathing about 12 to 18 times per minute, as the average adult should, how come your cells aren’t getting enough oxygen to produce ATP? The answer lies in your blood. It’s quite all right to admit that you don’t know what specific purpose your blood serves. The mere thought of it might even scare you. After all, the only time you see it is when you’re hurt in some way. That said, I’m quite certain you know you can’t live without it, even if you don’t know exactly why. Much of it has to do with the oxygen your cells need. Your bloodstream is a river of life, transporting oxygen to the cells that need it via your red blood cells. The whole process begins the minute you breathe. With each inhalation, air flows down to little air sacs at the bottom of your lungs called the alve- oli. Here, the oxygen you just inhaled hitches a ride on your red blood cells almost as if it was taking a cab. These red blood cells then take it wherever it’s needed, be it the cells in your heart, your brain, or any other organ. Pretty straightforward, right? You breathe, and the oxygen is quickly transported via your blood all over your body. That’s a simple enough process. However, like any transportation route, there can be delays and slowdowns. If you’ve ever taken a taxi in New York City during rush hour—or even if you’ve only seen it on TV—then you know what it’s like to be stuck in gridlock, bumper-to-bumper traffic: nothing moves. The same thing can happen in your bloodstream. That’s what’s happening to so many of us, and it’s exactly what was happening to me for such a long time. When your red blood cells aren’t flowing as quickly and easily as they should, the cells throughout your body don’t receive the oxygen they need when they need it, and are unable to produce energy. As a result, you feel horrible and completely deprived of energy. This dreaded traffic jam in your bloodstream occurs when your red blood cells are clumped together. How do they get that way? It all has to do with the acidity of your blood, and that’s caused by the food you eat. Do you see how everything in your body is interconnected? The pH scale is probably the last thing that comes to mind when you think about your blood. Why does it matter if your blood is acidic or alkaline? Ideally, you want the pH of your blood to be slightly alkaline, just over the middle of the pH scale, with a measurement of 7.35 to 7.45. Here, your blood is considered to be in homeostasis, which is the ideal point of balance that allows everything to function correctly. In homeostasis, your red blood cells are fully formed and circulating freely all over your body. There are no traffic jams of any sort. Unfortunately, much of our modern diet causes our blood to tip toward the acidic end of the pH scale, and this causes trouble for those regularly scheduled oxygen deliveries our cells rely on to produce energy. Meats, dairy, processed grains, and sugars are all acidic foods, and eating too many of them turns our blood acidic. Sadly, those foods make up much of what we tend to eat. Junk foods like cheeseburgers and ice cream are entirely made up of these acidic food types, but so are seemingly less troublesome foods like chicken alfredo and ham-and-cheese sandwiches. Come to think of it, there’s a good chance that most of what you ate today was composed of acidic foods. Again, your cells are like little batteries; more specifically, your red blood cells have a positive and a negative charge. In an acidic bloodstream, the outer negative charge is stripped from your red blood cells and their inner positive charge becomes exposed. That’s a problem, because the basic principles of magnetism apply to red blood cells as well: negative repels negative, and positive repels positive. Furthermore, positive attracts negative. If you have a bunch of red blood cells floating around only emitting a positive charge, they end up “sticking” to other red blood cells that still have their negatively charged outer shield intact. This is what creates the “traffic jam”—clumps of red blood cells floating around together when they should be zooming all over the place. If your blood is at the proper pH, all of your red blood cells keep this negative charge going, and thus repel each other, allowing your bloodstream to flow smoothly. This, in turn, allows the oxygen you breathe to be delivered efficiently to the organs that need it. If you want alkaline foods, you have to turn to vegetables and fruits, especially the green ones. We’ll get to why the color green is so important later in the book, but for now, just know that vegetables and fruits are your friends. Sadly, most people choose to ignore this sound advice. They eat their veggies out of bare necessity when they should be a major part of anyone’s diet. An occasional side salad isn’t enough, and the blueberries in the muffin you had this morning don’t count, either. It’s often said that most people’s diets are about 80 percent acidic and 20 percent alkaline, when the reverse should be what we strive for: 80 percent alkaline foods and 20 percent acidic foods. It’s an easy choice, but an uncommon one. I’m not telling you that you have to run out and become vege- tarian, but becoming more mindful of what you eat is essential to getting your energy back on track. It’s not something I expect you to understand how to do intuitively, especially when you consider the bad conditioning most of us receive around eating. That’s why I’ve dedicated the All-Day Energy Diet plan in Chapter 6 to laying down a specific diet and schedule to help get you back in balance. There’s an uncomfortable truth around blood alkalinity, and it’s this: for the most part, the modern medical establishment doesn’t regard the pH of your blood as an issue worth considering. Talk to your doctor about it, and he or she may scoff at your inter- est in this “invalid” concept. Don’t let this discourage you. Actually, let’s take a look at why your doctor’s hubris is worth questioning, and even countering. As you’ve seen from my medical journey, I didn’t start receiving the answers that I so desperately needed until I left “traditional” medicine behind and steered toward holistic nutritionists. Despite being a sick mess of a man, I just couldn’t be healed by the scores of doctors and specialists I sought out looking for solutions. It wasn’t until I started consulting some truly traditional principles about healing that I was able to bring my body into balance again. The sad truth is that your average doctor is not schooled in the field of nutrition. M.D.’s can diagnose diseases of all kinds and give you expensive, annoying pills to get rid of your symp- toms. Sometimes, they might even suggest surgery. However, it’s increasingly rare to find a doctor who can explain the origin of whatever disease or condition you’re struggling with. So often, simple medical solutions elude us because we’ve become unnecessarily tied to the thinking that a cure is better than prevention. How about solving our health problems by addressing the root causes? But for some reason the medical establishment wants to tuck these truths under the table. I don’t want to rant, so let me give you an example that pertains specifically to what we’re discussing in this chapter: the alkalinity of your blood, and how important that is to your energy levels. Again, many doctors will scoff at the idea that your blood pH has any impact on your health. Simply ludicrous, they’ll say. How- ever, they very likely will say that you need to incorporate more fruits and vegetables into your diet. Why exactly do they offer this suggestion? They probably will make mention of your need for more fiber and minerals, but they’ll ignore the fact—although they probably don’t know it to begin with—that boosting your vegetable and fruit intake will have a massively positive impact on your blood alkalinity and thus your cell health. You’ll be repair- ing your body on the cellular level. Without realizing it, they’re supporting the very thinking they so readily dismiss! Do you see why I get so frustrated with modern medicine? Now I’m not suggesting you don’t go to the doctor, or ignore any- thing your general practitioner has to say. That would be absurd and irresponsible of me. What I am saying is that there are aspects of your health that your doctor may not be familiar with, because these insights don’t support the financial interests of pharmaceu- tical companies or the health-care industry as a whole. You owe it to yourself to investigate healing modalities that produce tangible effects and provide practical insights. As with anything else, it’s all about balance. If you’re interested in a more thorough investigation of your blood health, then I highly recommend going to a naturopathic clinic to get a live blood cell microscopy done. Essentially, it’s a close analysis of your live blood cells. This is quite different from the blood sample you get done at your general practitioner’s office. In that procedure, your blood is taken via syringe, frozen, and sent off to a laboratory. There it’s analyzed for its cholesterol and blood-sugar information, which is very crucial, but not what we’re aiming to understand here. In a live blood cell microscopy, a drop of your blood is placed under a very high-powered microscope the minute it is taken from your body. This allows you and your naturopath to look at your blood in real time to see how your red blood cells are behaving. When my naturopath and I took a look at my blood, we saw exactly what so many people would see if they undertook this procedure themselves: a full-on, 5 P.M. traffic jam in my red blood cells. It was just the confirmation I needed that I had to do some- thing about my diet, and it was an important step toward the creation of the very plan that graces the pages of this book. It’s enough to use how you feel as a gauge, and changing your diet for the better is recommended for everyone, even if they aren’t experiencing a personal energy crisis. However, if you want to dig deeper and get some specific information on the state of your blood health and how it’s affecting your energy, then I definitely recommend looking up some naturopaths near you. I’m sure you’ve already gathered that I have no love for caffeinated coffee or energy drinks. Here’s yet another reason why I’m so vehemently against them: they’re acidic. We’ve already seen that these two culprits interfere with your cortisol levels and, after they’ve given you a temporary surge of energy, ultimately end up making you even more tired than you were when you consumed them. What makes them worse still is that they contribute to your blood acidity, wearing you down even more in the long run. The further we’ll get into the book, the more you’ll see that so much of what you ingest is bad for you in a number of ways. Caffeine and high sugar content attack you in many places at the same time, so you’re utterly defenseless. That’s downright scary! I have a little more information to share with you before we start improving your diet, but I hope that by the time you get to that chapter, you’ve already started to wean yourself off of these terrible quick fixes. If you haven’t already, I hope this additional information drives home this point: they’re just no good for you. It might be difficult at first to give up these energy “crutches” you’ve been relying on, but give it a few days and you’ll naturally start to reset yourself. Then you’ll truly be ready for the incredible diet info yet to come. Here are a few video reviews of The All-Day Energy Diet from people just like you. The principles in this book work – all the time – as long as you’re a human being living on planet earth and you actually take action. You’ll see for yourself in 7 days or less when you try it for yourself!